Mr. John Marshall, the managing director of Marshall’s Coaches, came to address the Society on this most interesting and personally-relevant theme. This was the joint meeting held in combination with the Engineering Society. Beginning at the start of the century, when Queen Victoria was approaching the end of her reign, Mr. Marshall reminded his audience that the principal mode of road transport was then trams or horse-drawn vehicles. Petrol engines were in their earliest stages, and had not been extended to public service vehicles. Carriers came into Newark from the nearby rural districts each Wednesday, to bring produce to Newark Market, and they would usually be prepared to offer a conveyance service to the villages, for people or goods. However, this was restricted to the early morning of that day, the traditional market-day, and the return journey would only be made after the market closed down in the early evening. Bus services were first set up in 1914, the initiator being W. Gash. Based at Elston, Mr. Gash began an experimental return service to Newark for one shilling and sixpence (1/6), equivalent to seven and a half pence today. This was, at first, on a casual basis. In 1920, the service was established on a legal footing, a licence being obtained under the laws then current. This allowed the operation of a Saturday service between Elston and Nottingham for a return fare of 4/6. Manchester-built vehicles were used, and these could be converted into trucks for other purposes during the week by a process of lifting-off the passenger compartment. This continued until 1920, when Gash bought a motor-bus from Bracebridge, Lincolnshire, for £28. A chevrolet, it was built using a light chassis, and was equipped with a roof-rack for the carrying of luggage. Soon, rival services began to appear. Also in 1926, Charles Herbert Wright set up the company which, in 1952, was to be known as Travel Wright. The original depot was beside Lincoln Road bridge, at the junction with North Gate. Buses operated to Ossington, Laxton and Ollerton, departing from the Wharf on market days. A number of smaller operators came along in succession; such a one was the Grove Motor Company, running to Sleaford, Grantham and Retford. In 1928, the Lincolnshire Road Car Company came along, superseding a group known as Silver Queen, mainly for routes in the adjacent county, but also serving Newark and Retford. A distinctive blue light and slogan 'Look for the blue light' characterized their vehicles until 1939. Lincolnshire Road Cars and W. Gash then began to operate from the Robin Hood Hotel, by the original site of Beaumond Cross. It was there that Newark’s bus station was sited until expanding space dictated the move to Lombard Street during the 1960s. Then there were no regulations governing companies and routes; it was effectively a free-for-all. Rivalries occurred, as more than one company could operate the same route. Moreover, times of services did not have to be set out, which one would have thought to have been inconvenient for passengers. The 1930 Transport Act went some way towards regularizing this. It directed that there must be regularization, to the inclusion of timetables. To prevent the use of untrained persons, drivers were required to obtain badges of status from the 'watch committee'; a badge would be issued for 2/6, remaining the property of the committee. Also, all vehicles must be subject to a regular inspection, initially the task of the Police, but later of the Traffic Commissioners. Buses had only rear brakes then. Hydraulic suspension had already been introduced. The Second World War of 1939–1945 brought restrictions to both the use and provision of buses. Fuel was at a shortage, most being reserved for the war effort, so services were necessarily curtailed. Leyland buses, named after cats, were mostly used. Up to 34 passengers could be carried, and the maximum length of the whole vehicle was 271/2 feet. No new buses, however, were built until 1942, owing to the need to concentrate engineering on aircraft and tanks that were essential to the conflict. To mask visibility by enemy aircraft, the roofs of all buses had to be khaki. Mainly double-deck buses were used, not only for supposed economy of space, but also because double-deckers were used as war buses. Only when the War ended in 1945 could cream-coloured roofs be adopted. Then, bus operators afforded much of their work to transport from nearby R.A.F. stations, as stationed airmen and their families required practical communication. By 1945, then, re-regularization of bus services was needed, as much of the earlier work in this had been lost. It was then that W. Gash took on the Newark to Nottingham route, for which most readers will best remember them, and which they retained until disbanding in 1988, a victim of low tenders. They were forbidden to stop between Newark and Farndon, in order to avoid coinciding with local services and diluting the passenger useage of the latter. The terminus was Huntingdon Street, Nottingham; in the 1970s it moved to the new Broadmarsh Centre. As buses were still double-deckers, the railway bridge at Saxondale caused difficulties, and the ‘low-bridge’ body design was adopted. In 1953, W. Gash opened its depot on Bowbridge Road, where it also remained until the company's closure. Services to Nottingham were generally hourly; extra services were supplied on market-days. The writer remembers that extra buses were also provided in the 1960s on occasions when Nottingham Forest was playing at home, especially for weekend matches. Special services were run for spectators, and these terminated at the City Ground. The 1950s brought further changes in bus design owing to the Suez Crisis. The lightest-possible vehicles had to be used to conserve petrol. Bristol Scs were adopted by Lincolnshire Road Cars. The small Albion Nimbus was also popular. 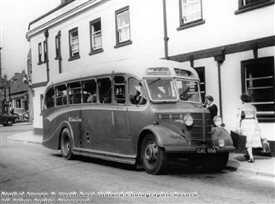 This era also saw the promotion of the coach, which later gained popularity for tours, and holidaymakers en route to the coast. A coach was more luxurious than a bus, and had a slightly higher top speed. When the law directing the fitting of seat-belts came in in the '70s, this compulsion was applied to coaches but not to buses. At first they had only to be provided; later legislation made their use mandatory. Unlike those on buses, all coach seats faced forward. The Bedford O.B., a 29-seater, was a popular choice. 1959 brought the Daimler Freeline, the engine of which was mounted beneath the floor, so effecting greater streamlining of the coach design and, incidentally, better vision for the driver and those passengers seated near the front. Mr. Marshall then went on to mention another coach-operator of the Newark area: Thomas Tours of North Muskham, run by John Thomas and, later, his son, Sid. Sid Thomas was revolutionary in approach to design. Characteristically, he allocated registration numbers ending in 333 to all his coaches, and gave them all feminine names. Lady Ann was one such; others were ‘Lady’ someone else. At first, the company ran services between Newark and Sutton. When, in 1935, these were taken over by Lincolnshire Road Cars, operations moved to tours only. Thomas Tours introduced vehicles having two front axles for added weight; the Bedford was chosen for this. Thomas Tours continued until 1976, when, owing to the sudden and untimely death of Sid Thomas, the company came to an abrupt end. The 1985 Transport Act brought the de-regularization of routes, so reversing earlier legislation and enabling competition, whilst retaining compulsory timetables. Because routes were put to tender, companies had doubts about the continuation of commercial services. It was in this year that the decline of W. Gash began. Nottinghamshire County Council took responsibility for 15% of services; the rest were open to bids. Lincolnshire Road Cars managed to continue; Travel Wright was secured thanks to the operation of tours. New companies, still in existence now, emerged after deregularization. Such were Kettlewell's, Trent and Pathfinders. The 1980s saw one more significant change by the extension of one-man operated coaches, first introduced in the '50s. On these conveyances, the driver was also responsible for collection of the fares and no conductor was in attendance. This was, of course, a means of staffing cutbacks, and meant longer pauses at bus stops as well as loss of jobs. In 1988, Mr. Marshall inaugurated his company, Marshall's Coaches Ltd, which continues in strength today. The school run has increased in operation during recent years, owing to the ability of parents to opt for education outside their own catchment areas. Throughout the talk, Mr. Marshall retained the interest of his audience by means of slides of the changing design of vehicles along with scenes of Newark across the twentieth century, as well as some of the neighbouring villages and towns. Transport history is an interesting and entertaining theme to most people, not just heritage enthusiasts or engineers, as it is at a level of understanding achievable by all, and a knowledge of road vehicles is, to some extent, possessed by the average individual. Thanks and congratulations must be extended to Mr. Marshall for a most enjoyable evening. © Roger Peacock for NALHS: 6th February 2012. The Great Northern Railway line passed through Newark at the junction of North Gate with Lincoln Road, the present A46. The road and the railway line intersected by means of a level crossing, which was replaced by the Lincoln Road bridge in 1930. Now sited in Brunel Drive, Travel Wright continues today for the organisation of tours as well as a number of local bus services. This page was added by ROGER PEACOCK on 17/04/2012.